Cape Town - Johannesburg - Kruger Park - Johannesburg, is additional. Visiting the two most popular areas in South Africa, our Cape Town & Kruger Park Safari delivers both a cosmopolitan city experience and exciting wildlife adventure including private game reserves and a walking safari. Book by March 31, 2019 for travel by July 31, 2019. Welcome to the ‘fairest Cape in the World’. 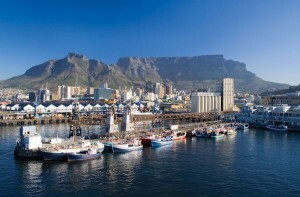 Colonial monuments co-exist with delightful modernity in the glorious city of Cape Town. Basking in a Mediterranean climate for most of the year, veteran travelers insist this setting tops even the trendiest resort in the south of France. Certainly… the wines are just as delicious! Relax and enjoy guided sightseeing: a cable car to the top of Table Mountain, a tour of the delightful city and an excursion along the full length of the Cape Peninsula. As a special treat: enjoy dinner in the home of a Capetonian family when traveling at the Classic, Luxe or Premier level. 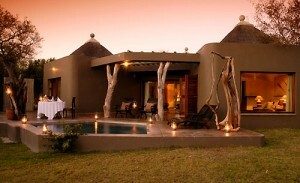 South Africa’s finest wildlife refuge, Kruger National Park, your safari paradise for 5 exciting days. Nothing compares to the thrill of seeing your first lion on the hunt. Be prepared for non-stop action as you search for the Big Five on morning and afternoon game drives at private game reserves. Open safari vehicles, expertly maneuvered by professional game rangers, allow for close-up encounters and superb photographic opportunities. During the quiet midday, a guided walking safari places you ‘nose to nose’ with the small denizens of the bush. Tempted to see a bit more? 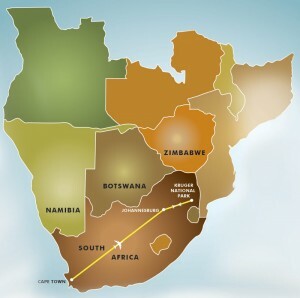 Think about adding Victoria Falls, Chobe Botswana or even an exciting extension to Kenya or Tanzania. Two glorious days exploring the city and environs. Ride a cable car up to Table Mountain and tour the colorful Malay Quarter. Pose on the very edge of the continent on a Cape Point tour. Meet penguins, seals and playful baboons. As a special treat for Premier Level: a Home Host dinner with a Capetonian family! Wing to Kruger Park… wildlife heaven! Daily game drives at private game reserves allow for close-up encounters with elephant, lions, giraffe, buffalo, zebra, hippo, and hyena, to name a few. A new part of Kruger, a new lodge and a new venue to double your game viewing opportunities! Open safari vehicles plunge into the bush in pursuit leopard on the hunt. Don’t miss the midday walking safari for a true bush experience! Cape Town must be one of the most beautiful cities in the world; no wonder, Sir Francis Drake, Captain and Explorer, described it as, “The Fairest Cape in all the World”. The safari experience was the best, can’t wait to return.